Source: Goyal M, Menon BK, Van Zwam WH, et al. Endovascular thrombectomy after large-vessel ischaemic stroke: a meta-analysis of individual patient data from five randomised trials. Lancet 2016;387:1723–31. Study Population: 1,287 stroke patients from five trials (MR CLEAN, ESCAPE, SWIFT PRIME, REVASCAT, and EXTEND IA) with anterior circulation large-vessel occlusion (predominately middle cerebral artery) randomized to endovascular thrombectomy or standard medical therapy within 12 hours of symptom onset. Narrative: Anterior circulation large-vessel occlusion (LVO) of the internal carotid or middle cerebral artery is one of the most devastating ischemic stroke subtypes. Prior to 2015, evidence supporting endovascular thrombectomy for acute ischemic stroke was limited.1, 2 This was due to multiple factors, including low recanalization rates with previous-generation thrombectomy devices, inadequate neuroimaging inclusion criteria (patients enrolled in trials lacked target LVO and/or had large preexisting core infarcts), and selection bias—patients considered most likely to benefit from thrombectomy underwent the procedure outside of clinical trials.1, 2 However, five randomized controlled trials3, 4, 5, 6, 7 published in 2015 established that endovascular thrombectomy significantly reduces disability in acute ischemic stroke when performed with stent retrievers in the setting of anterior circulation LVO and minimal core infarct burden. Four of these five trials were terminated early due to overwhelming treatment benefit, limiting analysis of secondary outcomes. A patient-level meta-analysis of all five trials was published in The Lancet in 2016.8 All subjects included in the meta-analysis had an anterior circulation LVO stroke. The median (interquartile range [IQR]) age was 68 (57–77) years with median (IQR) National Institutes of Health Stroke Scale (NIHSS) 17 (14–20) and Alberta Stroke Program Early CT Score (ASPECTS) 9(7–10). Median (IQR) time to recanalization of the occluded vessel with endovascular thrombectomy was 285 (210–362) minutes. The mRS, which is commonly used in stroke clinical trials, is a discrete functional outcome score with high inter-rater reliability and little room for subjective interpretation.11 Although participants and their families were not blinded to the treatment arm, to minimize bias, each individual trial employed a PROBE (prospective randomized open blinded endpoint) design, in which all outcome assessors remain blinded. Additionally, all outcomes were adjudicated by study personnel certified in scoring the mRS. In acute stroke trials, functional outcome can be analyzed by binary analysis (dichotomized ordinal outcome scales, i.e., “good” vs. “poor”) or by shift analysis (which evaluate outcomes over the entire scale range). One limitation of the mRS shift analysis employed in these trials is that it values each mRS strata equally. However, studies have shown, for example, that most people attach a higher value to an improvement from mRS 3 to 2 than to an improvement from mRS 1 to 0 (Figure 1A). This was accounted for in the DAWN trial,9 which employed a weighted shift analysis as one of the co-primary endpoints. Despite this limitation, the shift analysis has become convention in stroke trials because it provides information across a wider range of outcomes and, hence, is considerably more clinically relevant than traditional dichotomized outcomes. In conclusion, we assigned a color recommendation of green (benefit > harm) to this intervention because of evidence of patient-centered benefit for early endovascular thrombectomy in anterior circulation LVO stroke and absence of significant harm. This benefit was evident across a wide range of ages and was present irrespective of tPA eligibility. Berkhemer OA, Fransen PS, Beumer D, et al. A randomized trial of intraarterial treatment for acute ischemic stroke. N Engl J Med 2015;372:11–20. Jovin TG, Chamorro A, Cobo E, et al. Thrombectomy within 8 hours after symptom onset in ischemic stroke. N Engl J Med 2015;372:2296–306. Saver JL, Goyal M, Bonafe A, et al. Stent-retriever thrombectomy after intravenous t-PA vs. t-PA alone in stroke. N Engl J Med 2015;372:2285–95. Campbell BC, Mitchell PJ, Kleinig TJ, et al. Endovascular therapy for ischemic stroke with perfusion-imaging selection. N Engl J Med 2015;372:1009–18. Goyal M, Demchuk AM, Menon BK, et al. Randomized assessment of rapid endovascular treatment of ischemic stroke. N Engl J Med 2015;372:1019–30. Goyal M, Menon BK, Van Zwam WH, et al. Endovascular thrombectomy after large-vessel ischaemic stroke: a meta-analysis of individual patient data from five randomised trials. Lancet 2016;387:1723–31. Nogueira RG, Jadhav AP, Haussen DC, et al. Thrombectomy 6 to 24 hours after stroke with a mismatch between deficit and infarct. N Engl J Med 2018;378:11–21. Albers GW, Marks MP, Kemp S, et al. Thrombectomy for stroke at 6 to 16 hours with selection by perfusion imaging. N Engl J Med 2018;378:708–18. Banks JL, Marotta CA. 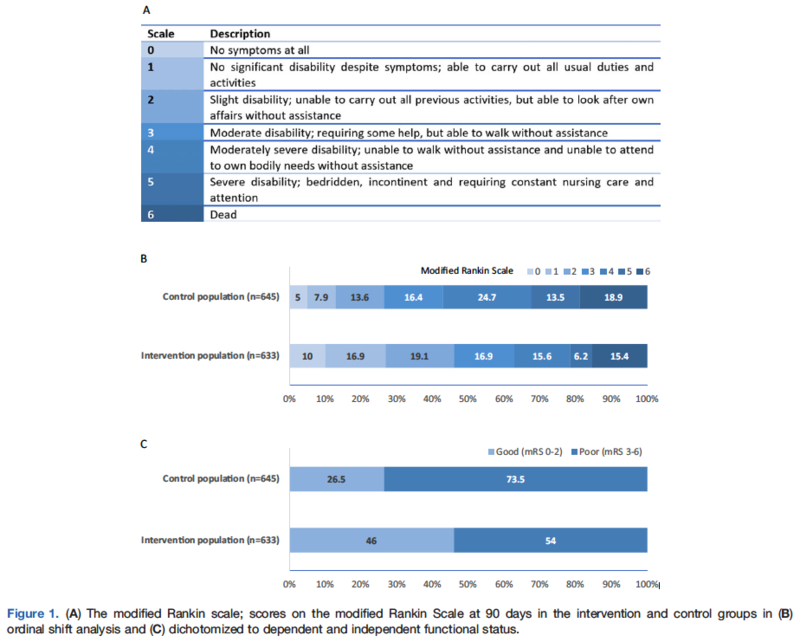 Outcomes validity and reliability of the modified Rankin scale: implications for stroke clinical trials: a literature review and synthesis. Stroke 2007;38:1091–6.